My wife and I moved to Red Oak, located 25 miles south of Dallas in 2010. 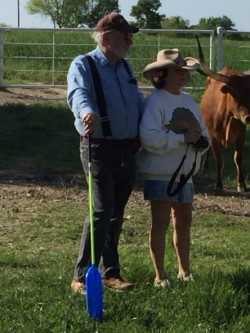 We both have cattle and ranching in our blood, and was anxious to get back to our roots. What started as a small purchase of two steers and three heifers in 2011, has grown to over 80 head. Our two mainstay bulls, Bodacious Cowboy, and Gringo’s Man of Joy combined with a strong group of brood cows, have produced for us a quality group of young heifers and bull prospects for sale. We are further expanding our ability to grow our herd by utilizing AI to expand our genetic program. Feel free to call or stop by to see us.